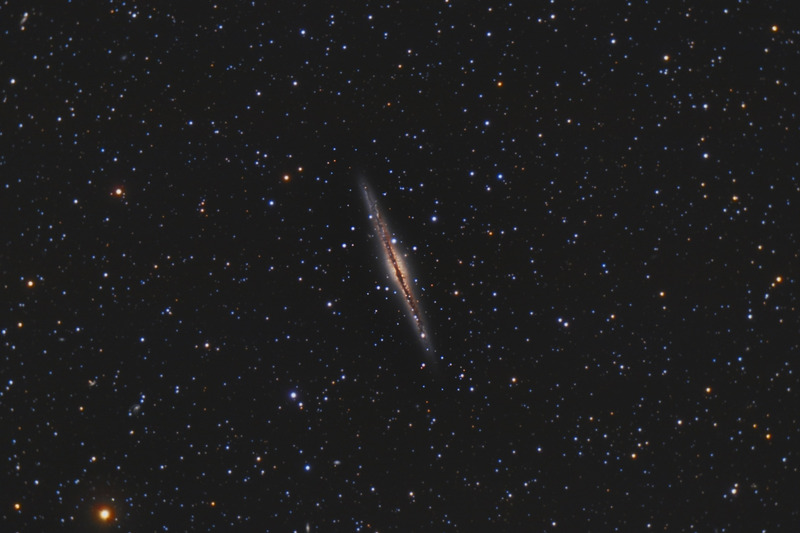 NGC 891 is an excellent example of an edge on spiral galaxy. Our own Milky Way galaxy would probably look like this if we could view it from the side. Prominent in this image is NGC 891's dark dust lane running the length of the galaxy, as well as the large central bulge typical in spiral galaxies. Also visible in this image are two dwarf satellite galaxies. One is about 1/2 way out from the galaxy core at the left top of the galaxy, and the other is just to the right of the central bulge (it looks like a slightly fuzzy reddish star). There are also about a dozen background galaxies scattered thoughout the image. NGC 891 is relatively close to us at a "mere" 30 million light years distant. As such, its apparent diameter in a telescope is fairly large - about 13' long by 2' tall. For comparison, the Full Moon is about 30' in diameter. In this image, North is Up. This image is cropped to 80% of the original full frame. Software Used Images Plus 4.0 for camera control, calibration, and stacking. Images Plus 5.0 for digital development, advanced Lucy-Richardson deconvolution, star shrinking, smoothing and noise reduciton, and multiresolution sharpening. Photoshop CS5 used for levels and curves, selective color, high pass filter, star shrinking, lab color, saturation adjustments, screen mask invert, lens correction, match color, and smart sharpen. Gradient Xterminator for gradient removal. Carboni Tools for additional noise reduction, and smoothing. Notes Although the seeing conditions were fair on both nights, I was very pleased with the fine detail I was able to capture in this image. This is a reprocess of an earlier version of this image using my DSLR-LLRGB workflow. With this reprocessing, I was able to bring out some much finer detail, while reducing the chromatic noise in the image.